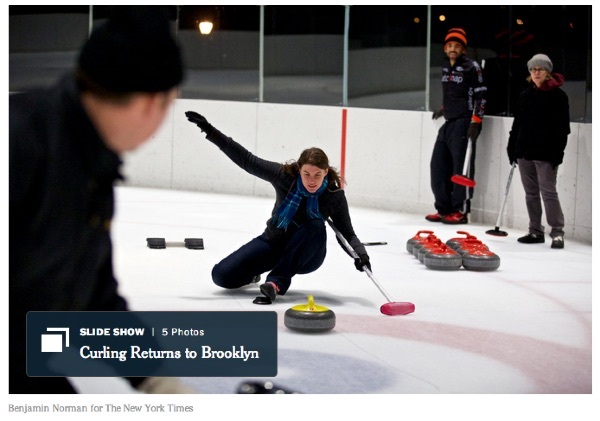 Great post this week in the New York Times about a new curling club starting up in Brooklyn: “In the Borough of Beards, Lay Down Some Ice, and Out Come the Brooms“. Congratulations to the folks there on the launch of their new club! If you’d like to help us bring curling to the Monadnock region of New Hampshire, please fill out our form and let us know! Thanks! This entry was posted in About Curling on December 12, 2014 by Dan York. What makes curling ice so different than other ice? What extra preparation has to be done to the ice? And how does sweeping really work? Curling stones weigh 44 pounds. They are concave, on bottom, which limits the contact they have with the ice. The curling stone’s concave bottom, which limits how much it comes into contact with the ice, and the pebbles reduce friction. Essentially, the pebbles melt a bit when the heavy stone runs across them, creating a micro-layer of water upon which the stone can glide. The pebbles create the “spin” (or curl, hence the sport’s name) of the stone after it’s released, at least in part; physicists contend that something called “wet friction” also accounts for the curl. Sweepers—those furious ice brushers who’ve become fodder for Olympic memes and GIFS—use a broom to brush the pebbles, thereby changing how the stone spins. Specific techniques melt the pebbles, reducing friction and helping the stone travel even farther and straighter. Naturally, the game changes as the pebbles erode, and sweepers have to constantly compensate. The article goes on to talk about the efforts made by professional ice-makers (and yes, there are those people) to prepare the ice for events such as the Sochi Olympics. 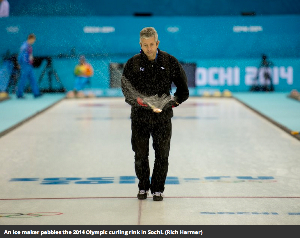 It’s well worth a read to understand why curling ice is different! This entry was posted in About Curling on February 20, 2014 by Dan York.